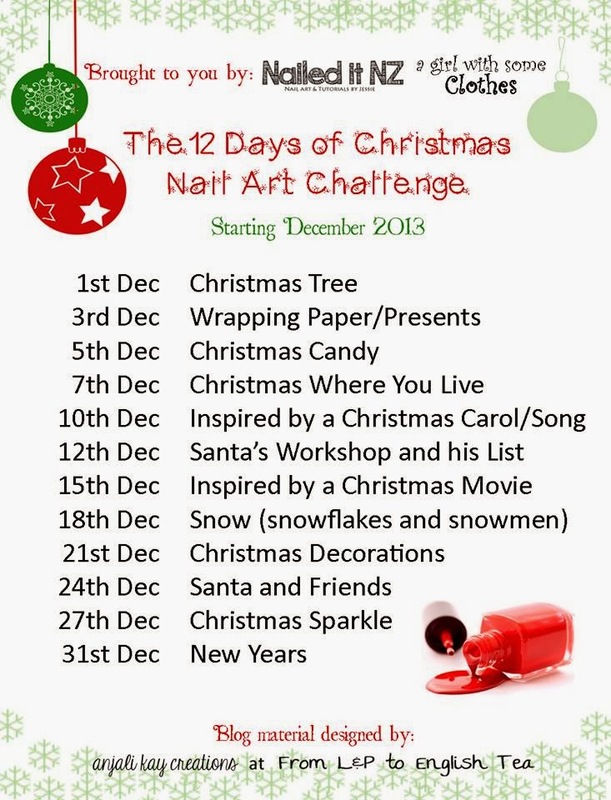 It's the seventh of December - we're up to day four of the 12 Days of Christmas Nail Art Challenge! Today's theme is "Christmas where you live." I've had a few questions about this one, so I'll quickly explain what it means. It's a very flexible challenge; just show on your nails what Christmas is like where you are. This could mean something about your country, your house, your town - whatever. It can also be what Christmas means to you, or special memories that you relate to Christmas time. For me, I chose to represent a New Zealand Christmas. 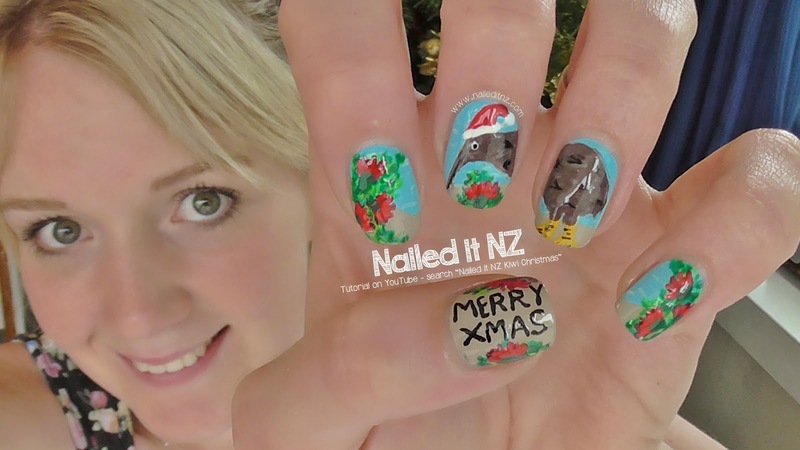 It took me ages to decide on the exact design though - there are so many parts to a Kiwi Christmas! I had at least two other designs I was really close to doing, but ended up choosing this one. Our Christmas is in the first month of Summer, which means that Christmas here is synonymous to holidays, warmth, sun, beaches and the outdoors. It's fantastic. 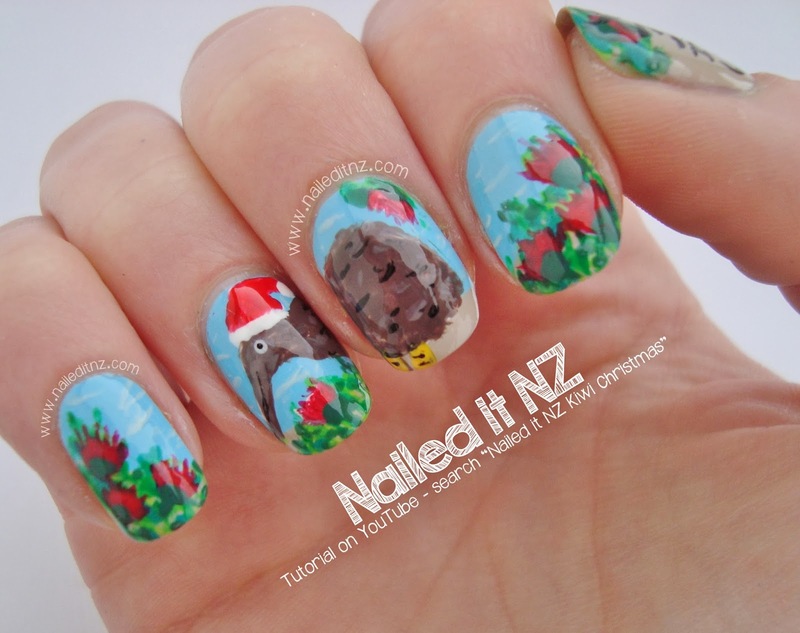 I decided to paint a beach scene, with a big ole' kiwi (wearing a Santa hat - see my inspiration here) in the middle of it. 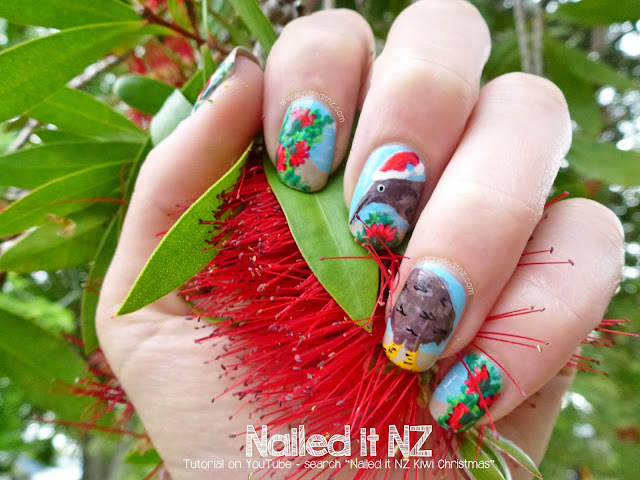 To the sides I added branches from Pohutukawa trees (known as the New Zealand Christmas tree) and on the thumb, I wrote the words "Merry Xmas." Hmm. Just realised that none of the main photos actually show my thumb! I had issues taking photos today - it's a bit grey and ugly (still warm though). You can see my thumb in the tutorial, though, and in the bottom photo in this post. Here's the tutorial! Please subscribe and 'like' my video, it really helps me get my tutorials out there :). Here's the other hand! As usual, I did this one first to learn the best way to do the design before filming it. That's why the beach is covered up by the pohutukawas in this one! I just realised that the reflection makes it look like the kiwi is smiling - cute. We have a pohutukawa tree in our front yard! Well I think we do. The leaves are the same, and it has the same basic flower colour and needles... but they're different shaped. I'm not sure if I just happen to have an unusally weird-looking pohutukawa tree or it's simply a different, similar looking tree. I'll make it my mission to figure it out. Next up in the #12daysnailchallenge we have "Inspired by a Christmas Carol/song" on the 10th December. That should be an awesome one, I can't wait! 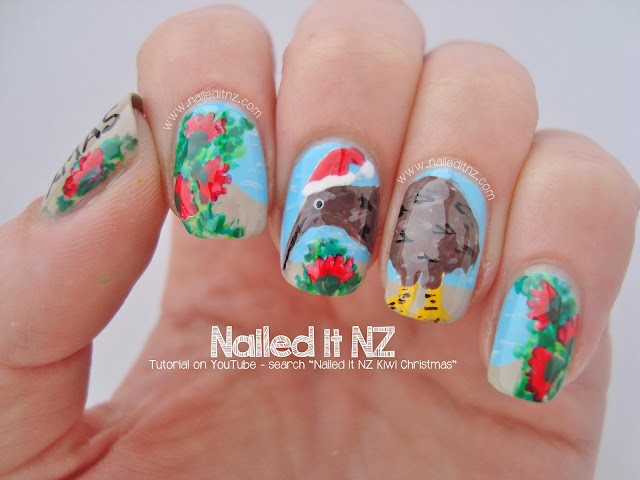 Remember to tag me on Instagram (@naileditnz) or post your design to my Facebook wall! I've got an awesome big album of all the recreations that I'll be constantly adding to as we go through the month. You can see all the photos that are in it already (and oh my goodness it is a lot) here. Here's the thumb - and me! Link your post for today's theme here. Yours are super cute, I love them! But thanks! OMG these are great! I could never do nail art on my non-dominant hand! Mess!